Heritage Golf Club, also known as Heritage Plantation due to the land that the golf course is built on was the site of True Blue and Midway Plantations, is part of the Legends Golf Group. Heritage Golf Course is known as the flagship of the Legends courses, and also as the slowest of the 5 courses. Located on the south end of Myrtle Beach in Pawleys Island, this premier Myrtle Beach golf course is a favorite among both locals and guests who book their Myrtle Beach golf packages year after year. If you are looking for a traditional southern lowcountry golf course, Heritage Golf Club is one that you will want to add to your Myrtle Beach golf package. Heritage Club is a Par 71 golf course that was designed by Dan Maples and Larry Young and spans over 600 acres in size – that’s a lot of area to cover! This Myrtle Beach golf course has been given many accolades, including #7 in the Top 50 Courses in Myrtle Beach and in the Top 100 Public Golf Courses in the Country – both by Golf Digest Magazine. Heritage Club also ranks in the top of courses to play in SC by GolfWeek. One of the reasons for the course being ranked so highly is the condition of the course, but also the natural beauty and surroundings. Large oak trees that are hundreds of years old, crepe myrtle trees, camellias, azaleas and of course Magnolia trees that you would expect on a former rice plantation are all landscape items that you can expect to surround all 18 holes of this gorgeous golf course. When you add Heritage Club to your list of golf courses to play for your Myrtle Beach golf package, you not only get a great round of golf, but a little bit of a history lesson too. Just off the green on the 4th hole, is where the family that maintained the original plantation are buried. On the 8th hole, you will notice a sign on the tee box telling you that up ahead is a slave burial ground. You’ll also get an opportunity to test your skills at Heritage Golf Club with several forced carry shots over water and of course the greens at this golf course are especially difficult and will test your patience. Finishing up at the 18th hole is a risk-reward play, where if you are willing to take on the water in two shots, you could end up with an eagle putt to cap off your round. Don’t forget to hit up the clubhouse for some food and take a seat in the outdoor area for a nice meal and a lovely view. 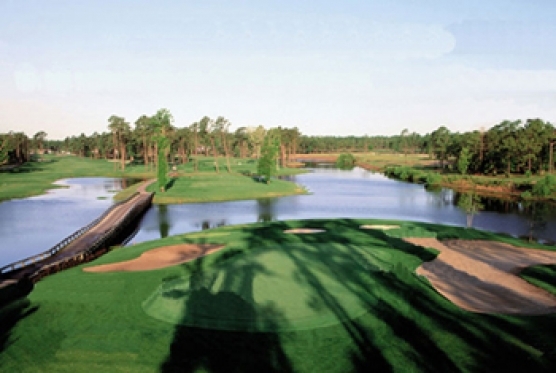 Add Heritage Golf Club to your Myrtle Beach golf package – this is not a golf course you will soon forget.